"Democracies can no longer address the problems created by the combined effect of globalization and the emergence of the immaterial. We confront new freedoms and crimes for which there is neither legislation nor police oversight; nor is there social or political legitimacy for trying to combat or even control them." This week, millions of youth around the world unleashed a cyber-attack against companies that refused to support the activities of WikiLeaks. It's easy to imagine that many of these young people are also regular users of Facebook, the social network created by Mark Zuckerberg. He's the Harvard student that at 23 years of age, with three colleagues on a fall evening in 2003, launched a social network for university students. Six years later, Facebook has become the biggest phenomenon on the Internet with 500 million members, which has made him the youngest billionaire in history. David Fincher, a penetrating director of thrillers like Se7en and Zodiac, and the bold and brilliant cult movie, Fight Club, decided to recreate the story of Zuckerberg. He directs an efficient film that would have been able to tell a beautiful Shakespearian story of solitude and shyness, which turns into one of greed and betrayal, if Fincher was Orson Welles or Nicholas Ray. The creator of WikiLeaks is Julian Assange, who supplied five newspapers of global prestige with confidential or even secret documents, which reveal practices by governments around the world considered criminal and detrimental to the freedom and rights of citizens. 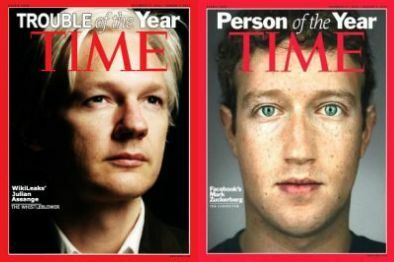 Both Zuckerberg and Assange are now, for many, heroes of the early 21st century. If Facebook is for making friends, WikiLeaks seems geared for making enemies. What they have in common is that both are initiatives of young cybernauts who have revolutionized our way of relating and informing one another. We, who no longer have the time to drink a coffee with a friend, are now making new friends every day around the world. WikiLeaks, on the other hand, is a new form of journalism that aims to scrutinize the activities of governments. Without regulation or control, Assange's initiative completely shuffles the data that, up to now, our democracies have lived with, revealing their frailties completely. The Internet is a "soft" revolution, but it will have the same effect on our lives that the industrial revolution had in the 19th century: a radical mutation from the model of Western society built since the end of the last war [WWII]. Democracies will no longer be able to address the problems created by the combined effect of globalization and the emergence of the immaterial. We confront new freedoms and crimes for which there is neither legislation nor police oversight; nor is there social or political legitimacy for trying to combat or even control them. The raw and simple truth is that states no longer keep us secure or ensure peace, freedom and justice. The brave new world is here again. Do not dare to imagine what it will be; but those who think it is possible to have a slow, peaceful transition from one world to another will be sorely disappointed. As Marx taught us, history is a succession of painful births - and civilizations are invariably built on the rubble of those that came before.